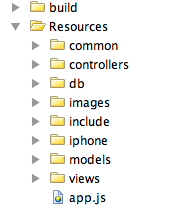 First we’ll start off with app organization. This seems simple, but it isn’t. In modern programming app design, we want to write and maintain as little code as possible, which means re-using code wherever possible. In order to do this with Appcelerator, we need to use good inheritance and OO design principles. First, we should create a base controller and view class. This uses a custom inheritance scheme by John Resig . // Create our controller for this window. As you can see, now we’ve got a main controller, which also instantiates a view. Now, the view can handle all layout code, and the controller can respond to those events, and affect the view appropriately. This works especially well when designing Universal Apps, as we can Design two views, a iPhoneMainView, and iPadMainView, and instantiate the appropriate one. I’ve created a Github project called Appcelerator-On-Rails to show this code. I use this template in all my Appcelerator projects and add to it when necessary. Scott, this is awesome. I’ve been looking for something like this for months. I will try to post some example code in the next few days. @magic_hat – check out https://github.com/smontgomerie/Appcelerator-MVC-Demo for an example project. Is there a way to create global variables? E.g. I want to access a certain value across all my controllers and views. @John – Because of the way Appcelerator handles execution contexts, you have to pass variables from one window to the next. For example, in building a navigation controller-based app, I typically pass a pointer to the nav controller to any windows I add to the stack.